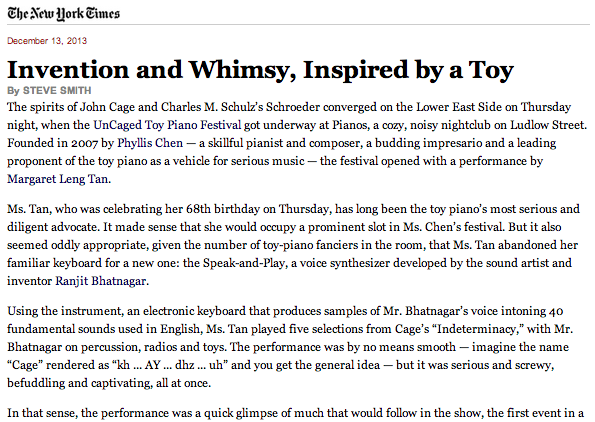 The 2013 UnCaged Toy Piano Festival, organized by the brilliant toy pianist and composer Phyllis Chen, is coming to New York on December 12, 13 & 14. Visit uncagedtoypiano.org for all the details! I’ll be participating in two of the three nights of the festival: On Thursday the 12th, Margaret Leng Tan and I will present the first public performance on Speak-and-Play, a new instrument, with selections from John Cage’s Indeterminacy. On Saturday the 14th, my toy piano robot Vexbot will continue its important work of playing Satie’s Vexations over and over so that human pianists don’t have to. Speak-and-Play is a musical instrument created by Ranjit Bhatnagar which turns language into music and music into language. Each key on the keyboard corresponds to one of 40 fundamental sounds in the English language. A computer program converts English text into a piano score which can then be played to speak the original text which generated it. The same score can also be interpreted as melody, giving every word and phrase its own unique note pattern. With practice, a pianist can say anything in English entirely through the Speak-and-Play keyboard. We will perform five selections from John Cage’s Indeterminacy. Each is an anecdote intended to be read in exactly one minute, along with auxilliary sounds and an unspecified musical accompaniment. For this Indeterminacy performance, Cage’s words will at times be heard through Speak-and-Play along with the music that encodes the language; at other times, just the music generated by the text will accompany the live human narration.